yapresident | the first Kazakhstani web-resource for Presidents, Investor and Enterpreneurs. Before the opening ceremony, the heads of state visited the Heritage of the Great Steppe exhibition, which reveals the main provisions of the article by the First President of the Republic of Kazakhstan – Elbasa Nursultan Nazarbayev, “Seven Facets of the Great Steppe”. The exhibition featured masterpieces of ancient art from Kazakhstan from the collections of the National Museum of the Republic of Kazakhstan, including the Issyk Gold Man, the reconstruction of horses and horse equipment from the Berel Kurgans, the Taksay Princess, unique exhibits of the State Historical and Cultural Museum-Reserve Әzret-Sultan. Speaking at the ceremony, President of Kazakhstan Kasym-Zhomart Tokayev thanked President of the Republic of Uzbekistan Shavkat Mirziyoyev and the Uzbek people for their warm welcome and hospitality. – We are connected by a single language, religion, common history and one destiny. Our people are the heirs of the ancient and great civilization of Central Asia. We were able to preserve the traditions, values ​​and cultural and spiritual heritage of the ancestors, having passed through many meaningful trials together, – the Head of State emphasized. Kassym-Zhomart Tokayev noted that the strategic partnership and the fruitful cooperation between Kazakhstan and Uzbekistan are a logical continuation of the historical friendship, reaching an even higher level at the present stage. – Cross-border cooperation is growing stronger, and trade is steadily growing. I can firmly say that today there are no problematic issues in Kazakh-Uzbek relations. Thanks to the efforts of the First President of the Republic of Kazakhstan – Elbasy Nursultan Nazarbayev and the respected President Shavkat Mirziyoyev, the Kazakh-Uzbek relations are experiencing a real upswing, – the President of Kazakhstan said. Quoting Abay, the Head of State said that the great poet called on the Kazakhs to learn from the fraternal Uzbek people its virtues, especially modesty and hard work, and thanked the leadership of Uzbekistan for supporting Kazakh culture. “I would like to express my gratitude for the large-scale measures stipulated by the decree of President Shavkat Mirziyoyev on the broad study and promotion of the creative heritage of the great Kazakh poet and thinker Abay Kunanbayev, ”said Kassym-Zhomart Tokayev. The President of Kazakhstan dwelt separately on the measures being taken to support the Uzbek diaspora in Kazakhstan. “We are doing everything to ensure that the Uzbeks permanently residing in our country can fully satisfy their spiritual and social needs. In Kazakhstan, there are dozens of Uzbek ethnocultural centers open in almost all regions. The Uzbek language is represented in Kazakhstan in the media field, the education system, and cultural life. “Two Uzbek theaters are enjoying success with the audience,” said the Head of State. Kassym-Zhomart Tokayev told those present that the past Year of Uzbekistan in Kazakhstan, in which more than 200 joint events were held, contributed to strengthening bilateral ties, and particularly noted the first Interregional Forum in Shymkent. – We are consistently moving towards the achievement of our goal – an increase in bilateral trade to 5 billion dollars. Work is underway to enhance the transport communication. The development of the transit and logistics infrastructure of our countries opens up serious opportunities to enter the markets of Europe and Asia, the President of Kazakhstan emphasized. 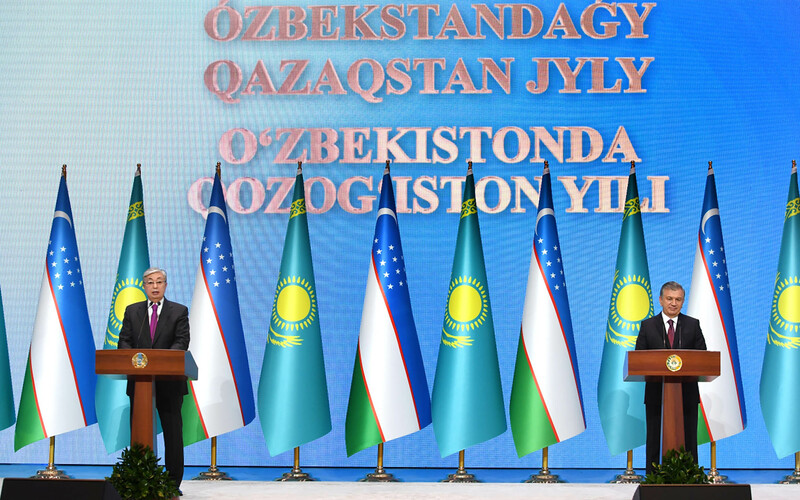 The head of state noted that the Year of Kazakhstan in Uzbekistan had become a significant event, which is of particular importance not only for bilateral relations, but also for creating an atmosphere of mutual understanding and trust throughout Central Asia. – Successful economic development, stability and security of Central Asia largely depend on the close cooperation and concerted actions of Kazakhstan and Uzbekistan. I propose to link together the main spiritual and historical centers of our countries, which are the property of not only Turkic, but also of all world culture. And in the operational mode to open a tourist cluster, connecting Turkestan, Samarkand, Bukhara into one route, – said Kasym-Zhomart Tokayev. In conclusion, the President of Kazakhstan stressed that the common duty of the present generation is to preserve the friendship and unity of the Kazakh and Uzbek people, bequeathed by their ancestors, and declared the Year of Kazakhstan in Uzbekistan open. The solemn ceremony ended with a gala concert with the participation of recognized masters and famous artists of Kazakhstan Alibek Dnishev, Ayman Musakhodzhayeva, Mayra Mұhamedқyzy, Medet Chotabaev, Nurlan Bekmuhambetov, Dimash Kudaibergen, Maria Mudryak and other masters of the scene and creative artists. Fragments from M.Tulebayev’s opera “Birzhan-Sarah”, choreographic compositions performed by the theater “Astana Ballet”, the State Dance Ensemble of the Republic of Kazakhstan “Saltanat”, the State Republican Academic Uygur Theater of Musical Comedy. K. Kuzhamyarov and the State Republican Academic Korean Theater of Musical Comedy were presented to Uzbek audience. Speaking to reporters, the President of Kazakhstan stressed that the state visit to the Republic of Uzbekistan coincided with the opening of the Year of Kazakhstan in Uzbekistan, and noted that these events will serve to further strengthen bilateral relations between the countries. Kasym-Zhomart Tokayev highlighted the role of the First President of Kazakhstan – Elbasy. N.Nazarbayev and President of Uzbekistan Sh.M. Mirziyoyev in strengthening and developing Kazakh-Uzbek relations. – They managed to open a completely new page in the history of cooperation between Kazakhstan and Uzbekistan and bring our relations to a completely new level. For my part, as the Head of Kazakhstan, I intend to ensure the continuity of the policy of Elbasy and continue the development of comprehensive Kazakh-Uzbek interaction. This is confirmed by the Joint Statement of the Presidents signed today by us, which reflects the main achievements and further horizons of our cooperation, the Head of State said. Noting the high level of trade and economic cooperation between the two countries, the President of Kazakhstan stressed that various measures would be taken to maintain such a high rate. – We have noted the need to search for new niches and expand the product range. Our goal is to ensure the growth of mutual trade up to $ 5 billion by the end of 2020, ”said Kasym-Zhomart Tokayev. In the context of the development of industrial cooperation, the Head of State noted that thanks to the business conditions created, the number of Kazakh-Uzbek joint ventures is growing. – Successful examples of such interaction are projects on joint assembly of cars, trucks and other equipment in Kazakhstan. Taking into account the special significance of this sphere for our economies, an agreement was reached on continuing active work in this direction, the President of Kazakhstan said. Kassym-Zhomart Tokayev also noted the successful holding of the Forum of inter-regional cooperation at the end of last year and stressed that such meetings offer great prospects for two countries. – The issue of creating the International Center of Trade and Economic Cooperation on the border of Uzbekistan and Kazakhstan was considered separately. The implementation of this project will streamline cross-border trade, improve the access control of infrastructure, as well as create a large trade and logistics hub in Central Asia, said the Head of State. In addition, the President of Kazakhstan focused on cooperation in the field of fuel, water and energy, cooperation in the field of export-import, transit transport, expansion of cultural, humanitarian and youth contacts. In conclusion, Kassym-Zhomart Tokayev expressed satisfaction with the results of the talks held and indicated that the implementation of the agreements reached would further develop cooperation between Kazakhstan and Uzbekistan in the traditions of friendship, trust and good neighborliness. 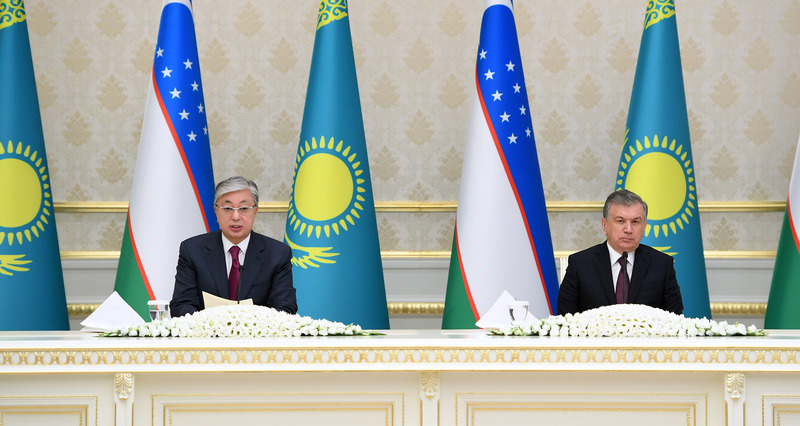 In his speech, Shavkat Mirziyoyev noted with deep satisfaction that the talks with Kassym-Zhomart Tokayev were held in a spirit of openness and complete understanding, during which the parties confirmed the unity of the long-term goals of developing relations, thoroughly discussed the bilateral cooperation agenda, regional and international issues, and also stressed the importance of strengthening joint measures to counter new threats and challenges to security. – I want to express my gratitude to the distinguished son of the Kazakh people, the First President of the Republic of Kazakhstan – Elbasy, my brother, the esteemed Nursultan Abishevich Nazarbayev, for his huge invaluable personal contribution to strengthening Kazakh-Uzbek relations and expanding multi-dimensional cooperation. All the impressive achievements of Kazakhstan in strengthening statehood, forming a strong civil society, establishing a modern and competitive economy, and increasing the country’s authority in the international arena are connected with his name, the President of Uzbekistan said. In addition, Shavkat Mirziyoyev said that the Road Map will be signed to implement the agreements reached during the visit.